Paperless, instant, engaging. It’s how your company’s giving scheme should be. Your employees can donate to any of our registered charities or easily set up their own projects and volunteering activities. 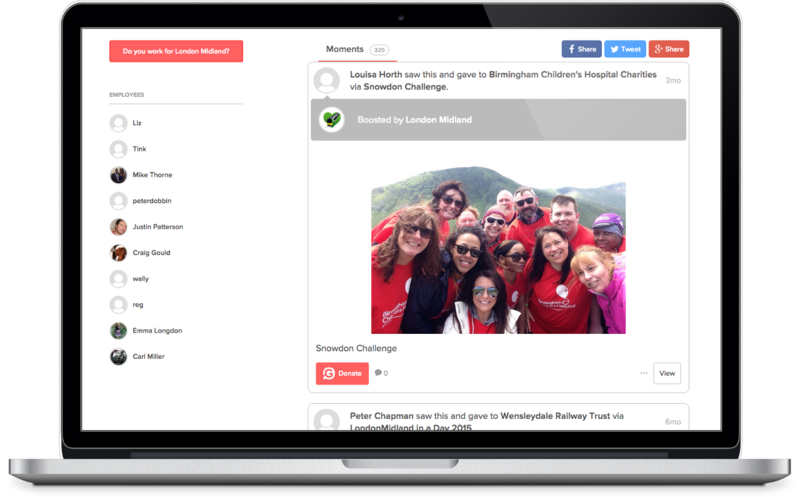 They’ll all appear on your very own company page in an activity stream of good causes and activities which you can share. Collating all your giving activities on Givey strengthens relationships with employees, boosts productivity and happiness, improves brand perception and allows you to manage workplace giving easily under one platform. Get started today by adding your company and invite your employees along too - it’s completely free to register and we’ll guide you through. Upgrade to our patent-pending matching technology to really deepen employee engagement and support your workforce. Every eligible donation is instantly matched through the Givey matching engine and these donations feature your company name and logo. These ‘good news’ stories can also be shared on employees’ social media, helping to raise your company profile and empower your employees. The results of Givey's recent experiment with Ogilvy's 2,000 employees, putting payroll giving and Givey to the test! After working with Givey, London Midland learned that 84% of their employees felt they were a responsible employer. Before using Givey this was only 44%!
" Givey for Business has supercharged our employee matching scheme! Not only does it simplify the process for colleagues, it also allows us to use the power of social media to raise even more money for good causes. " " Love the UX - so easy to donate… all awesome. I was happy to see a very local hospice back home listed, which I donated to"
Contact enquiries@givey.com, or sign up below to set up your page!